Each year, the MAFP recognizes members for their hard work and dedication to Minnesota family medicine. The nomination period for the 2019 Academy Awards has ended. Nominations for the 2020 Academy Awards will open in October 2019. Kimberly Tjaden, MD, of Sartell, MN, is the 2019 Family Physician of the Year. Andrea Westby, MD, of Minneapolis, MN, is the 2019 Educator of the Year. Ryan Brower, MD, of Mankato, MN, is the 2019 Resident of the Year. Hanna Nedrud of Minneapolis, MN, is the recipient of the 2019 Medical Student Leadership Award. Marilyn “Susie” Nanney, PhD, MPH, RD, formerly of Minneapolis, MN, is the recipient (posthumously) of the 2019 Innovation & Research Award. 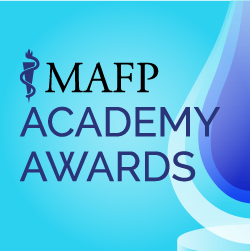 A sixth award, the MAFP Merit Award, is given occasionally for exceptional service to the MAFP; any MAFP member can nominate another member by emailing office@mafp.org with the nominee’s name and reason for nomination. The President’s Award, discontinued in 2016, was awarded to members of the MAFP at the discretion of the MAFP president.